We work together with our colleagues on a daily basis, but collaboration doesn’t stop here. More and more, users are finding that they need to collaborate with people outside the organization, mainly focusing on sharing documents. These people outside your organization are described as external or guest users. Whether they are vendors, partners, suppliers or contractors, your company requires tools to work closely with them. External sharing can be risky business, so most administrators will simply choose to disable external sharing in Office 365 all together. This leads to the rise of cloud services mainly focusing on file sharing. Dropbox and Box immediately spring to mind. The power of these services lies in the ease of use, for every type of user. You don’t have to be a technical person to use their services. Combine this with accessibility on every device, a reliable sync engine and you have a winning solution for sharing externally. But this has its own lot of problems. How do you, as a SharePoint or Office 365 administrator, keep track of what users are sharing via these services? How do you know sensitive data isn't being stored where it shouldn't? The answer to both of these questions is: you don't! Companies rely on a Modern Workplace to facilitate collaboration internally and externally. Office 365 empowers the Modern Workplace for organizations all over the globe, so companies can’t ignore the need for external sharing but aren’t able to provide alternatives for outside services such as Dropbox and Box. This leads to shadow IT and is a huge risk for loss of sensitive data and security breaches. They must act and provide tools that not only support internal collaboration but also external. Office 365 offers powerful collaboration tools. Are these tools sufficient in facilitating external collaboration? Let’s take a closer look. 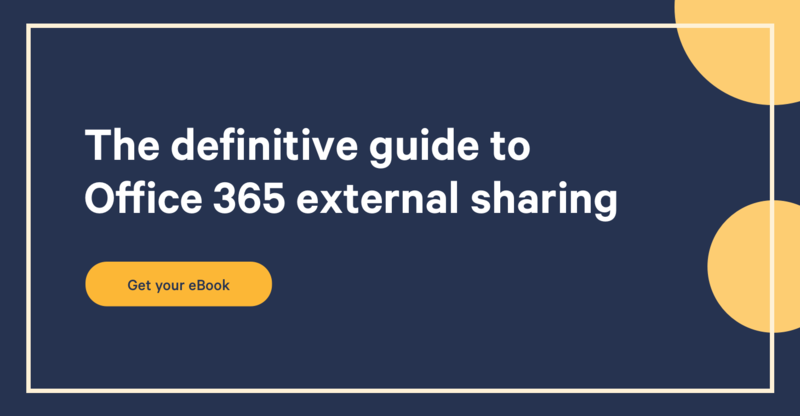 Bonus: Find out more on external sharing with the The Definitive Guide to Office 365 External Sharing. Office 365 Groups provides a specific group of people a selection of collaboration tools. These tools are excellent for internal collaboration, but what about collaborating with others outside of the company? Microsoft introduced external access for Office 365 Groups in September 2016. Here's a common scenario: you have an external guest user in your Outlook Groups. This user will be able to send e-mails to the Outlook Group, so everyone within will receive the message. Vice versa, when an internal member sends an email to the group, the guest user will receive it. It's important here to note they don’t have access to the e-mail inbox and calendar. There is also no access to Planner for external users. They will, on the other hand, have access to the group's SharePoint and OneNote. Once a guest is invited to the Group, he or she can work with all the documents and other content, but only according the given permissions. You'll also notice a difference in the user experience between internal and external members. This can be extremely practical, although here is one major limitation. If you don’t want to invite an external user to the whole group, but only want to share a single document from the said group, it’s not possible without the external user being invited or added in Azure Active Directory first. It’s crucial that you are aware of this limitation before you start, otherwise it can seriously hurt your adoption process going forward. I sincerely hope Microsoft is going to make this process easier, because we've seen multiple customers using other third-party tool for external collaboration due to the above issue. Teams is one of my favorite collaboration tools within Office 365. I have written many blogs about Teams and will write many more in the near future. Although Teams is part of Office 365 Groups, there isn’t an option available for external access just yet. Microsoft has announced external access for a release in Q2, but unfortunately, the number one requested feature has been delayed. It's a shame really, because Teams is Microsoft’s answer to Slack, and being able to collaborate with external users should be part of the service to win over Slack users. Meanwhile though, you can share the connected SharePoint Team Site with external users. External access for regular SharePoint sites works almost the same compared to Modern Team Sites connected to an Office 365 Group. The major difference is sharing with anonymous users. Currently, this is only possible for classic SharePoint sites. Sharegate has written extensively on the subject, so I won't go into more detail here. OneDrive for Business is your personal workspace, but you do have the option to share your content with external users. My blog article on OneDrive for Business goes into more detail on this topic. Enabling external access within your Office 365 environment is unavoidable. Did you disable external access in your company? If you answered yes, it's almost guaranteed that your business users are going to find another way to collaborate with external users. At the end of the day, they have to get their job done, with or without you. To prevent shadow IT, you have to enable external access. That said, you really have to think about security & compliance. Luckily Microsoft provides a lot of features for keeping an eye on security in Office 365. Begin by learning and configuring the available security & compliancy tools in Office 365 and decide what other tools are beneficial and applicable for your organization. It's also important to educate your business users on proper sharing practices and enable external access. You don’t have a choice in this day and age, as it's a crucial part of the Modern Workplace.